Offer your time and talents for the blessing of LCG’s ministry. We need volunteers every Sunday to carry out our worship service, and we have something for every age and ability. If you would like to sign up for one of the tasks below for one Sunday or for the whole month, please contact the church office at lutheranchurchofguam@gmail.com. Training is available! Unlock the doors and turn on all the lights and air conditioning units to prepare the building for worship. Make LCG a welcoming place! Greet everyone who comes in, hand out bulletins, point out important things, usher for communion, take offering, take attendance, and be a general go-to person during service. Light the candles at the beginning of service and assist during communion and with other tasks the pastor needs. A great role for children! Read the day’s scripture lessons from the Bible aloud during service. Help the pastor distribute the Holy Communion. Provide snacks to share over fellowship following service. Also prepare coffee, juice and other drinks and clean up after fellowship. Organize the offering from the service for deposit and total up and record the giving for the day. Assist the pastor with communion; reading the daily prayers, parts of the liturgy, and the scripture readings; and other parts of service. 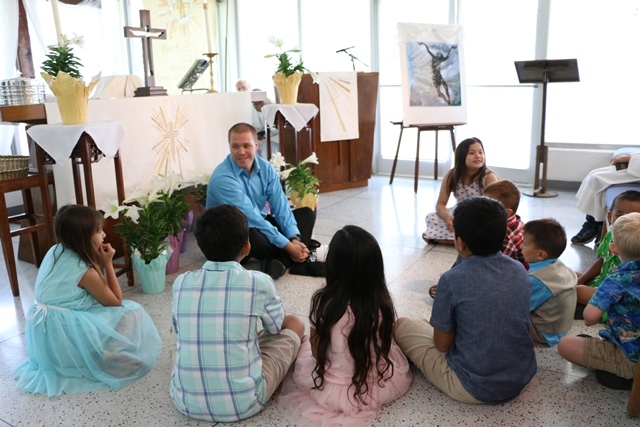 Prepare a 5-10 minute message for the children during service to help them understand the day’s lesson and lead them in prayer to close. Straighten chairs, pick up, take out trash, reset classrooms, turn off lights and air conditioning units, and lock all doors. Usually about 3 people do this together.